[i am a dekaphobic]: [UPDATED] Cocktail Festival with Matthias Giroud at Buddha-Bar Manila on April 17 + Giveaway! [UPDATED] Cocktail Festival with Matthias Giroud at Buddha-Bar Manila on April 17 + Giveaway! Experience a Buddha-Bar Manila evening like no other when Matthias Giroud, Chief Bar Manager of Buddha-Bar Worldwide flies in for a one-night only cocktails feast called Cocktail Festival with Matthias Giroud on April 17, 2015. The metro’s most sophisticated restaurant-bar-lounge promises the ultimate cocktails night with the visiting mixologist concocting an array of great cocktails and demonstrating the techniques he has acquired and honed through the years. Guests get to taste Matthias’ special cocktails and new mixes for Php1,000. Discounts will be given to students and teachers who wish to watch a master mixologist at work, creating magical concoctions that inspire awe. Constantly experimenting to up the ante in the art of mixing drinks, Matthias Giroud never fails to leave audiences amazed with his unparalleled cocktail creations. By nature, mixologists resemble artists, skilled not only in creating blends of flavors that complement each other perfectly but masters of performance and presentation as well. Hailing from the French Antilles, four distinct islands that offer white-sand beaches, Gallic glamour, and gastronomy, Matthias grew up travelling the world with his parents. In essence, he was reared to become an explorer and adventurer. At 18, the young Matthias landed his first bar job at the legendary “Bar Fly Paris” and it also marked his long-standing stint under George V Entertainment. Armed with a prodigious gift, a winning personality and work ethics, Matthias rose to become the chief bar manager for all the venues run by the group including the emblematic “Buddha Bar,” “Barrio Latino” and “Barlotti” in no time at all. Soon he was conquering the world, designing, conceptualizing, training and putting in place the bar operation for all subsequent openings of the George V Entertainment group around the world. His remarkable journey has seen him traverse the continent, from Monaco to new York and from Mexico to Sao Paolo, through the Middle East right to the yet-to-be-discovered corners of exotic Asia. It is but fitting that Manila is the next stop. Buddha-Bar Manila guests are bound to marvel at this French wizard of Buddha Bar’s signature mixed drinks. Three of my blog readers will get a chance to experience this amazing event because I will be giving away tickets (worth Php 1000 each) to Buddha-Bar Manila's Cocktail Festival with Matthias Giroud on April 17, 2015! A ticket will allow the guest to try all the cocktails made by Matthias and a Chef Special Snack Platter. 1. Giveaway ends on April 15 midnight. Three winners will be announced the next day. 2. 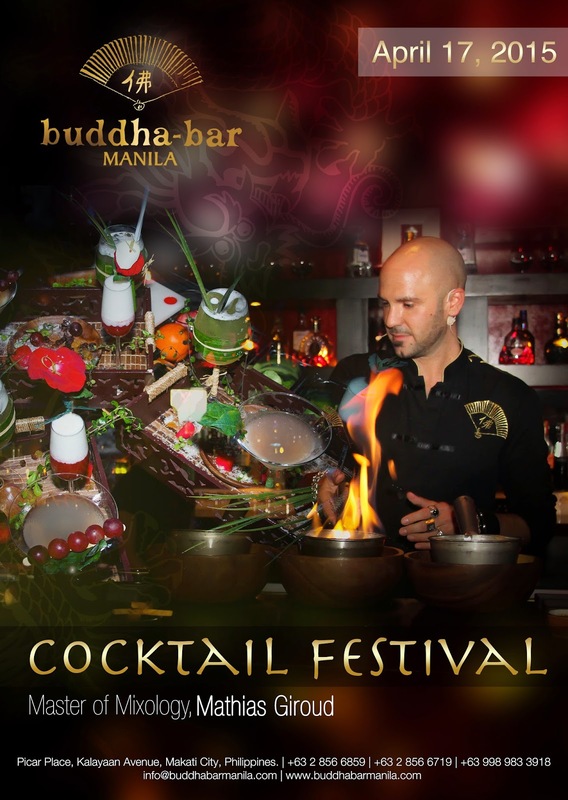 Winners must be able to attend the Cocktail Festival 2015 at Buddha-Bar Manila on April 17. 3. Winners may claim their tickets at the same venue on the same date. Best of luck, everyone, and hope to see you there! I will send you an email on how to claim the tickets on Friday, April 17! See you! Buddha-Bar is a restaurant, bar, and hotel franchise created by restaurateur Raymond Visan and Claude Challe, with is original concept started in Paris, France, in 1996. In 2012, Buddha-Bar Manila was born with the aim to bring the concept of orientalist “lounge” ambience serving Pacific Rim menu. With menu centered in “family concept,” Buddha-Bar Manila’s menu are meant for sharing, lifting anyone’s experience not only worth-remembering but with great value as well. Best sellers are the Buddha-Bar Chicken Salad, Beef Tamarind, Spicy Angry Chicken, and Sushi selections. Consistently rated as one of the best restaurants in Manila and as featured by Philippine Tatler Best Restaurants in 2014, Buddha-Bar Manila aims to deliver a distinctively better experience to one’s senses and taste palates. Where did the original Buddha-Bar concept was born? In what year Buddha-Bar Manila started in the Philippines? 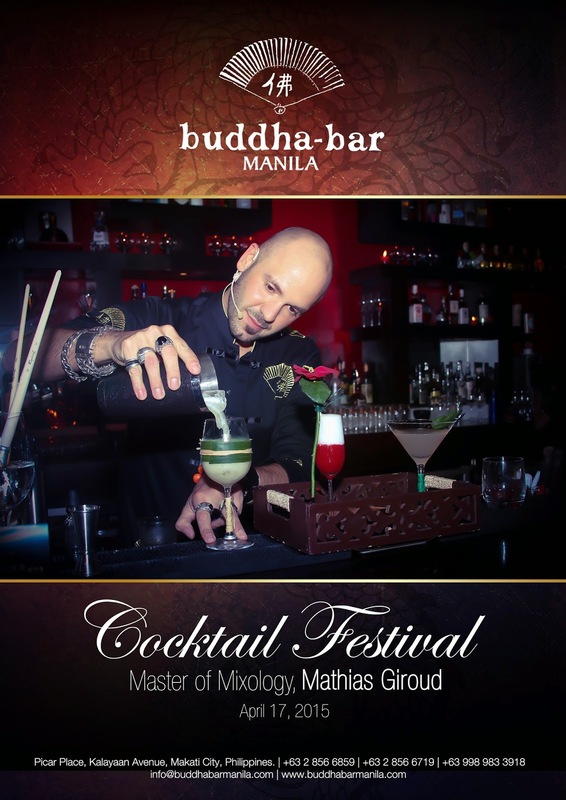 Who is the world-famous "Master of Mixology" that will visit the visit Buddha-Bar Manila for the 2015 Cocktail Festival?